Lately, I've been playing around with Shreddage-2. It's an excellent sample-library for electric guitar and it sounds very, very good. You can hear some of these experiments over at soundcloud.com/jasonrubenstein - that's where I put my various works-in-progress, ideas, demos, experiments, mistakes, and other noises. I'm not sure how, or whether, I'm going to use this sample library for the next record. On the one hand, it's pretty fun to mess around with and it sounds good; on the other, I might rather hire a guitarist & record their interpretation of the directions I provide. On the other other hand, this is a great opportunity to use the sample library to create something original rather than just imitate the djenty-dude-of-the-week. For example, say, how about sending the signal through a bunch of Moog signal processing... I don't know. Anyway, playing with Shreddage-2 isn't really the point, and thus I bury the lede: I'm in the middle of a process, again. I'm fishing around for new ideas and techniques for the next record. This is basically hours and hours of practice, play, experiments, and feeling around for ideas. At least a half-hour a day during the week, and as many hours as possible on weekends. The process is pretty broad at this point in the work: I practice piano exercises just about every day. Mainly the first ten Hanons, over and over and over. And over. I'll start at around 92bpm to warm up the hands, and end up at about 108bpm. It keeps the chops up, and the skills improving every day. Then, time allowing, improvisation until my hands give up or I have to get up & go to the office. The other part of this process is to play. Fiddle around. Experiment for new textures, ideas. See how they feel, how they fit. "Hey", I said, "what if I run a medieval lute sample through a Mesa Boogie amp simulator? Or a rectangle wave while I modulate the width?" I'll pick weird scales & riff on them for a while. Or substitute distorted B3 for double-tracked guitars in a heavy riff. The goal of all of this is to widen my palette and vocabulary of sound, texture, feeling. When I start working on the tracks for the next album and start answering the questions "What do I want to hear right now? What do I feel right now? And then what happens? And what happens after that? ", I'll have a few more creative choices that are quick-at-hand. 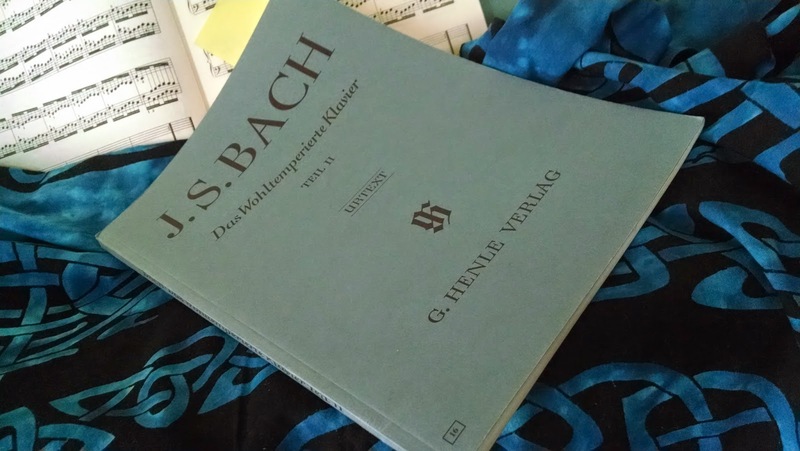 Anyway, today I want back to Bach. I dug up a couple of preludes from The Well-Tempered Clavier and analyzed the chords & scribbled them down. Then, played around with the chord progressions in various patterns and time signatures. 5/8, 7/8, 11/8, 6/8. I did a lot of "What if..?" stuff. Most of what I came up with was terrifically uninteresting. But some of it was pretty cool, and I'll keep it for future consideration. Process, which most of the time feels like "I have no idea what I'm doing -- but I'm doing it anyway."